Small kitchen design can be a challenge. Traditional wisdom calls for a triangle layout in a kitchen where the stove, sink and refrigerator are placed in a triangle. This allows for maximum efficiency when preparing meals, but small kitchens don't always allow for the space to create a food prep triangle. 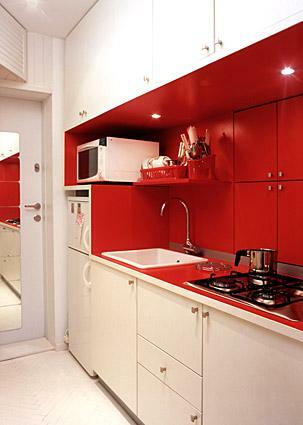 The good news for people struggling with how to design a small kitchen is that the galley kitchen is back in fashion. The galley kitchen is one where all of the appliances are connected and placed in a row. Since all of the appliances are so close together, it makes cooking very efficient and it leaves room in the kitchen for a small seating area. Sometimes you don't have a choice in the layout of your small kitchen so triangles and galleys aren't options. If that is the case, there are some other things you can do to maximize space and visually enlarge the area. Less is more when it comes to furnishing a small kitchen. Choose sleek, simple lines for the table and chairs. Lucite or ladder backed chairs will make the room seem more open and allow light to shine through the room. Stores like Ikea and Crate and Barrel make great butcher block and stainless steel work stations that can double as tables, prep areas and storage. The light wood and metal combos aren't too visually heavy for a cramped kitchen. Minimalist and sleek industrial looks work really well in small kitchens. However, if ultra modern décor isn't your style, you can still pull it off. Just add soft wall colors and fabrics. Small can be beautiful, but only when you keep it in scale. If you have a petite kitchen but your fixtures and other decorative elements are standard sized or larger, think about downsizing your accessories and fixtures. Smaller light fixtures, a smaller microwave and a less elaborate window treatment will make your kitchen look like it's just right. Use light colors in a small space, especially a kitchen. White and pale yellow walls can make a room seem larger. Dark colors will make the space seem smaller. Contrast the light walls with a few dark wood or bright colored accents. This gives the room some visual interest. Plus, just because a kitchen is small doesn't mean it needs to be light on luxurious touches. If your budget allows, add high end appliances in stainless steel and copper, small touches of dark, exotic woods and bright accents. These details bring drama to a small space. Bright lighting is key to small kitchen design. Avoid shadows and dark corners with high wattage bulbs. A brightly lit space will appear larger than it actually is. It will also aid in preparing food and cleaning up after meals. To make ceilings appear taller than they are, avoid hanging pendant lights and opt for recessed lighting instead. Open shelving is all the rage, and it has some big advantages over those shuttered wooden built-ins. Those expensive cabinets are huge and make your kitchen look much smaller. 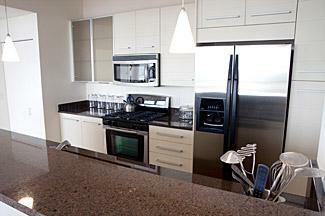 Try removing one cabinet door and see how much bigger and more friendly the space looks. If you don't want to lose the doors on all your cabinets, consider open shelving for one prominent wall. You can put your decorative serving items in the open cabinets and make an attractive and room enlarging display. Clear or tinted glass decorations, backsplashes, cabinet doors, light shades, countertop elements and shelving will create the illusion of added space. Using so much glass in the kitchen is higher maintenance, but it can be a showstopper. If your kitchen shares a wall with an adjacent area, like a breakfast nook, dining area or family room, consider using the same color scheme throughout. Blending the two areas will make them both look bigger. The kitchen is home to lots of big stuff, like the refrigerator, stove, built-ins and countertops. To make the space seem larger, try using the same background color, or similar shades, throughout. Your countertop space is probably at a premium because it's cluttered with lots of small appliances. You may want to keep the can opener in place, but consider stowing small appliances you don't use every day. Freeing up some open area will make your kitchen look larger, airier and more organized. There are probably kitchen appliances you can't live without, but that doesn't mean you have to turn your small kitchen into a warehouse for your stuff. Instead of having a toaster, toaster oven, microwave, range and griddle, opt for appliances that combine some of these features in one. You'll save space and your kitchen will look more streamlined. Embrace the philosophy that less is more. Do you really need two fruit bowls, a candy dish and an apothecary jar on display? Do those wall prints really add anything to your design? Are those decorative plates over the door a nice touch or a bit of kitsch you really don't need? When designing small spaces, less is almost always more. Take a look at your design. If you think you may have gone overboard with something, you probably have. Scale back a bit. The most important consideration in designing a small kitchen is storage. No kitchen ever seems to have enough storage regardless of square footage. So organization and planning are key in cramped spaces. Hang pots, pans and utensils from the ceiling. To avoid a cluttered look, try to purchase all of your utensils in the same material. All stainless or all copper looks neater than a mix of metals. 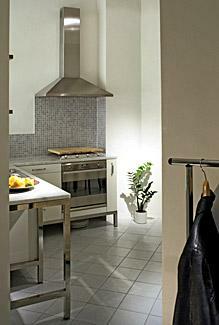 When considering small kitchen design ideas, remember to integrate, declutter and use light to advantage. You'll be creating a brighter, more attractive and more functional space.